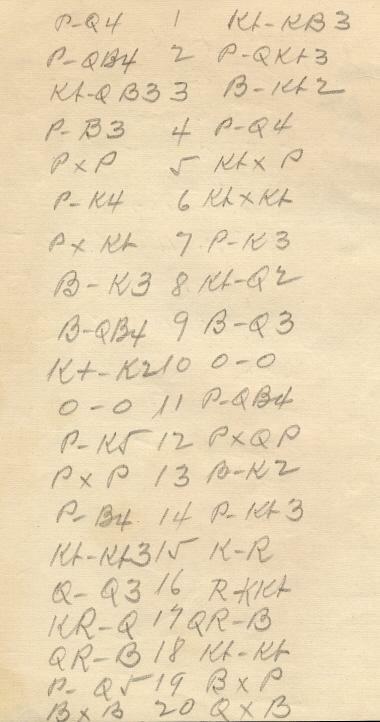 On 28 April 1987 Olga Capablanca Clark offered for sale the score-sheet of an unknown game played by her late husband and Tartakower in Paris circa 1938. 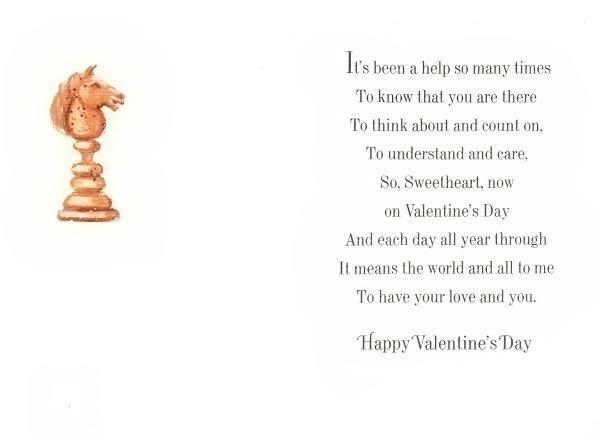 The text of her letter to us is given in The Genius and the Princess. 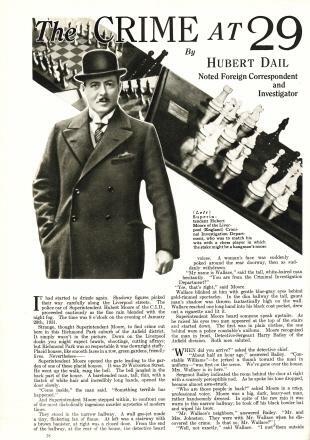 The reserve price for the score-sheet was not met, and a footnote on page 181 of Kings, Commoners and Knaves mentioned that in 1998 we were unaware of the document’s whereabouts. 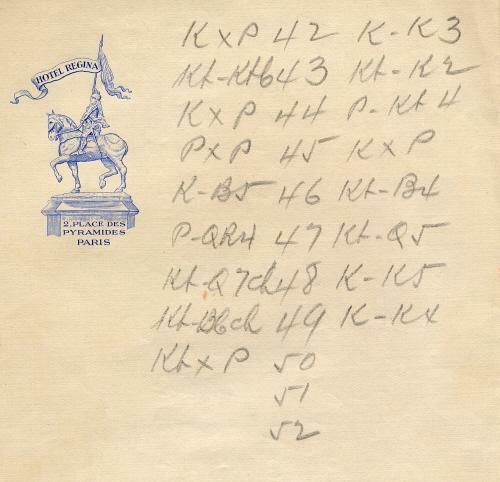 Subsequently (see C.N.s 5323 and 6687) we learned that the score-sheet had become part of the collection of Mr David DeLucia (Darien, CT, USA). In Memoriam will be published later this month. 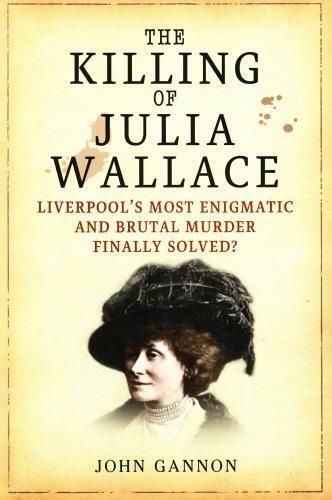 Readers interested in ordering the set are invited to let us know, and we shall forward their enquiries to Mr DeLucia. 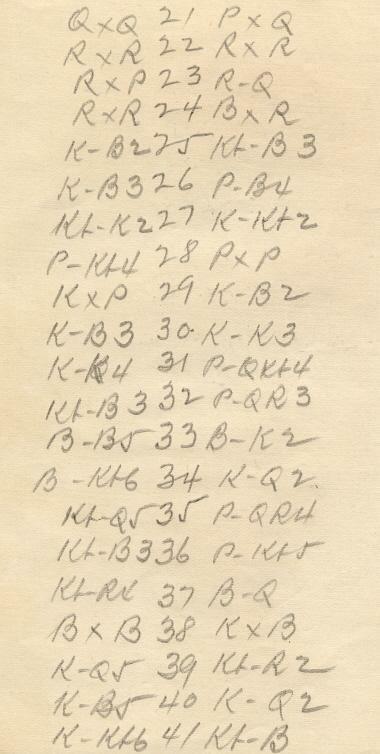 Alexei Shirov (Riga) informs us that the handwritten inscription in Latvian reveals that the occasion was a simultaneous display given in memory of H. Mattison by J. Kļaviņš. 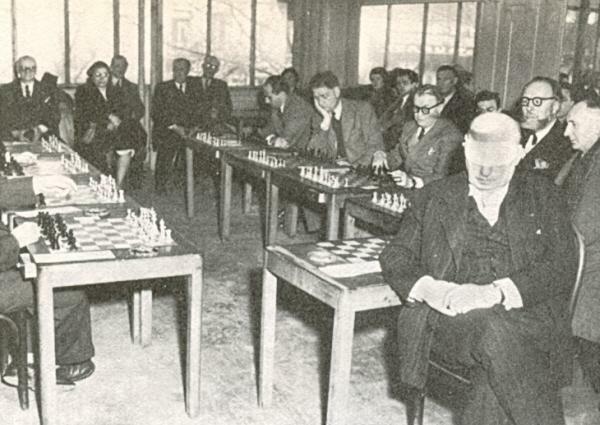 For purposes of comparison, it may be noted that Jānis Kļaviņš (1933-2008) appears in the photograph section of Mikhail Tal Tvortshestvo 1962-1967 (Riga, 1998). 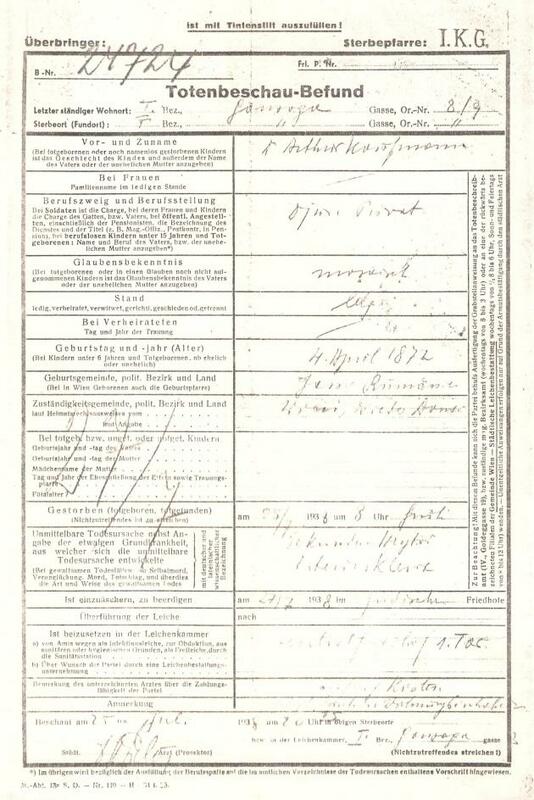 Kļaviņš was also identified by Hassan Roger Sadeghi (Lausanne, Switzerland). 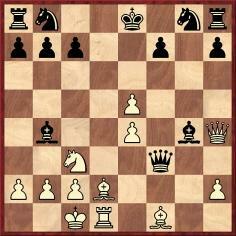 31 f4 Re8 32 Rxe8 Kxe8 33 fxg5 fxg5 34 Kd3 Ne5+ 35 Ke4 b6 36 Kf5 Ke7 37 Bb7 Nc4 38 Bxa6 Ne3+ 39 Kg6 d5 40 Bb7 Nxg2 41 Kxh6 g4 42 Bxd5 Ne3 43 Be4 g3 44 Kg7 Nf5+ 45 Kg6 Nh4+ 46 Kg5 g2 47 Bxg2 Nxg2 48 h6 Kf7 49 c4 Ne3 50 c5 b5 51 Kf4 Nc4 52 c6 Kf6 53 Ke4 Ke6 54 h7 Nd6+ 55 Kd4 Resigns. 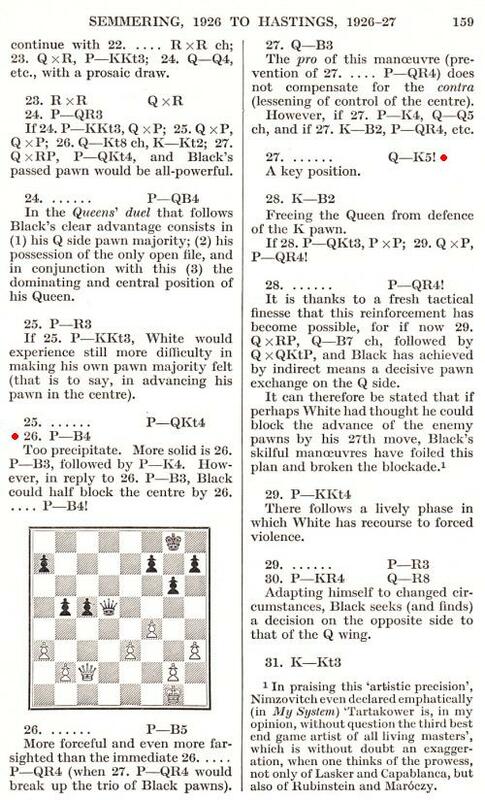 Mr Wrinn adds that Spassky scored +30 –2 =10, as stated in the report on pages 30-31 and 34-35 of Chess Horizons, April-May 1987. 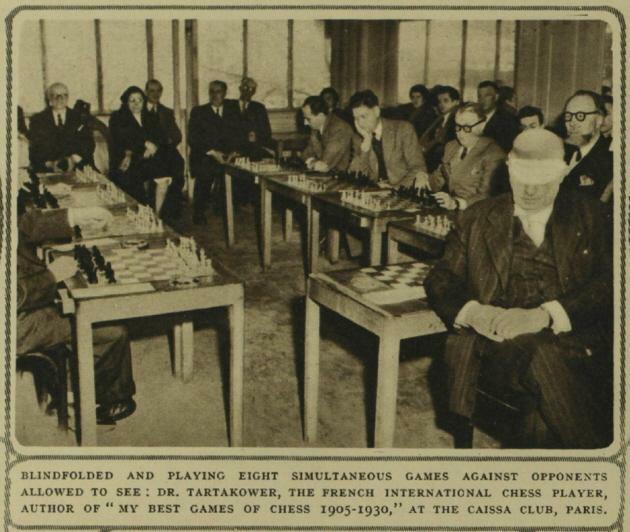 The magazine had four photographs of the occasion (which included a lecture), as well as annotations by Peter Vlahos to his victory over the former world champion. 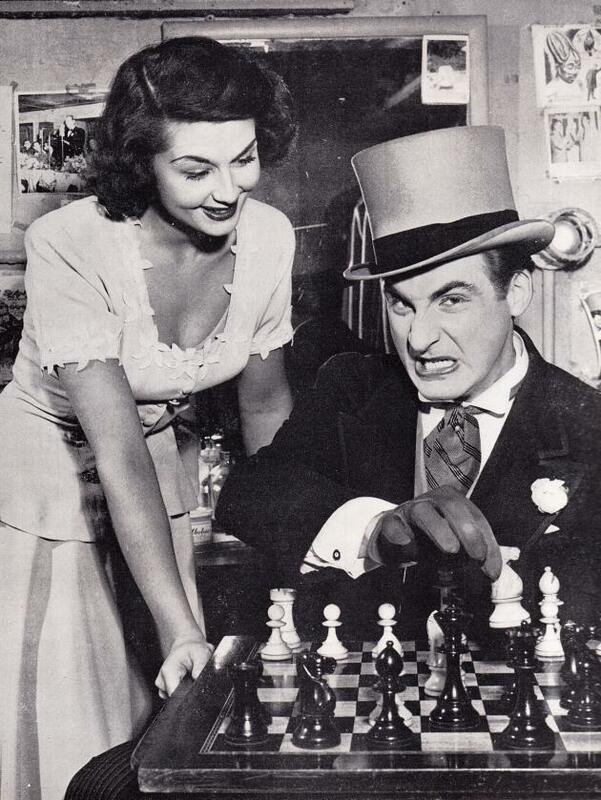 Details are still sought about Birdie Reeve’s chess activities, further to the published claims that she was a prodigy and blindfold exponent. In the meantime, three photographs which we have acquired recently are in our feature article on Birdie Reeve. 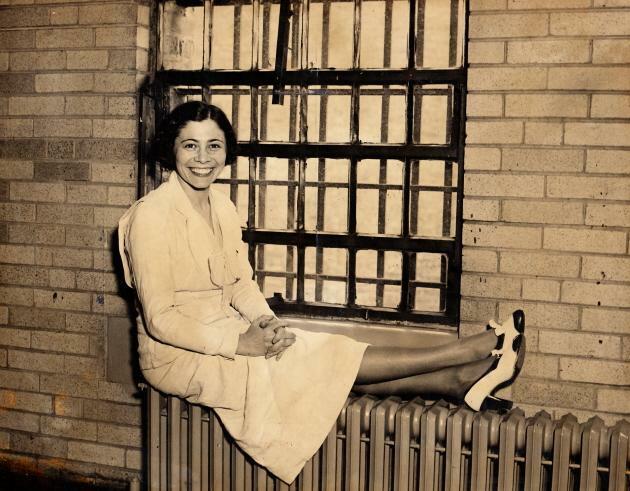 They date from 1935, when she was jailed. 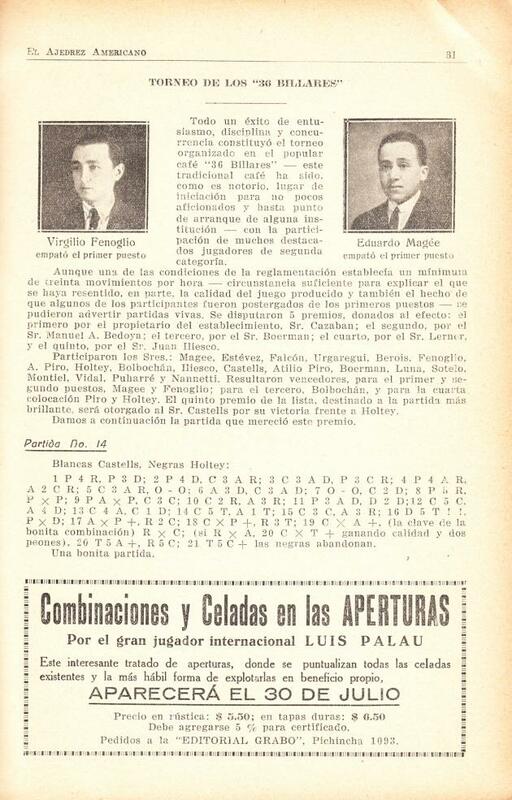 Félix Valderrama Loyola (Barquisimeto, Venezuela) reports that during a meeting which he had with Julio Bolbochán in Caracas 20 years ago the latter stated that his elder brother, Jacobo, gave Alekhine considerable assistance as a sparring partner in Buenos Aires in connection with the 1927 world championship match. 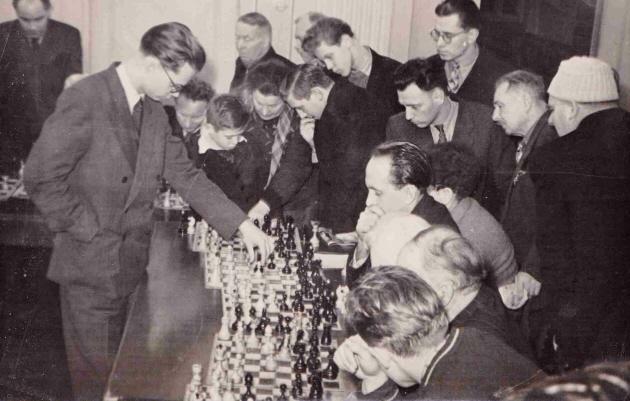 Our correspondent asks what solid information exists concerning Alekhine’s preparation for that match, beyond what he wrote in Auf dem Wege zur Weltmeisterschaft (Berlin and Leipzig, 1932). 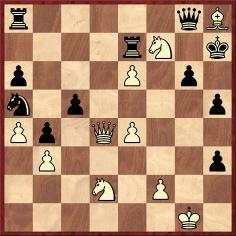 White gave mate in three moves. Source: Galveston Daily News, 27 April 1890. Can games and other details be found? 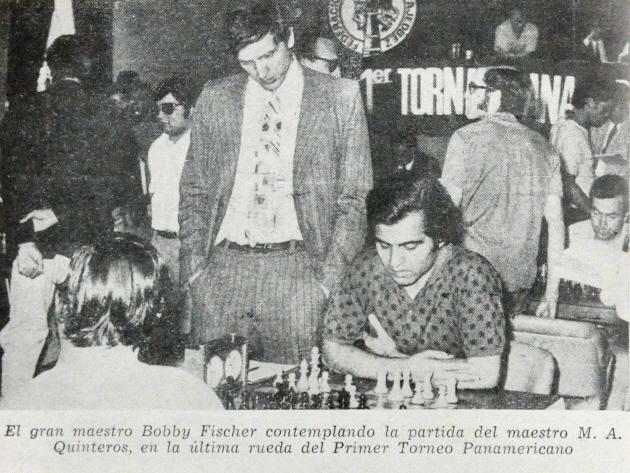 John Donaldson (Berkeley, CA, USA) points out that during a radio interview (Baguio City, 27 January 1999) Fischer stated that after defeating Petrosian in the Candidates’ final match in 1971 he undertook a tour of Argentina for simultaneous exhibitions. In all, he tentatively recollected in the interview, he gave 25 or 30 displays; he insisted on having the original of each game-score (a total of perhaps 600-1,000 games). Fischer added that the game-scores, unpublished, were subsequently stolen from him. Mr Donaldson asks whether this list can be expanded and whether it is known where the game-scores are now. 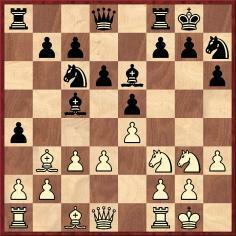 16 Qh5 gxh5 17 Bxh7+ Kg7 18 Nxh5+ Kh6 19 Nxe6+ Kxh5 20 Rf5+ Kg4 21 Rg5+ Resigns. 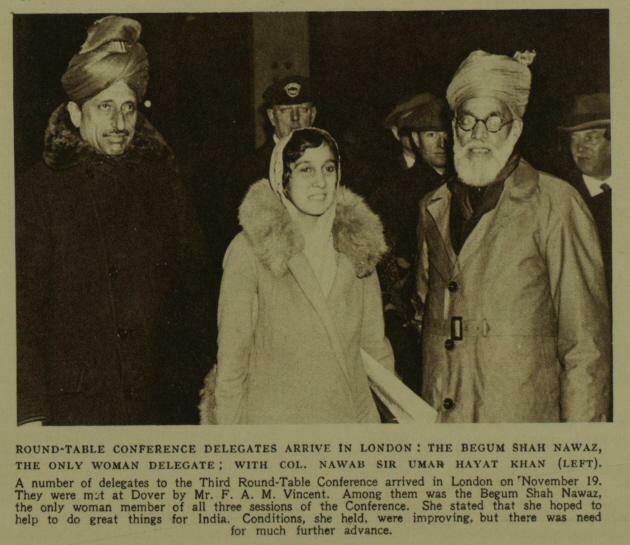 Illustrated London News, 20 March 1937, page 506. 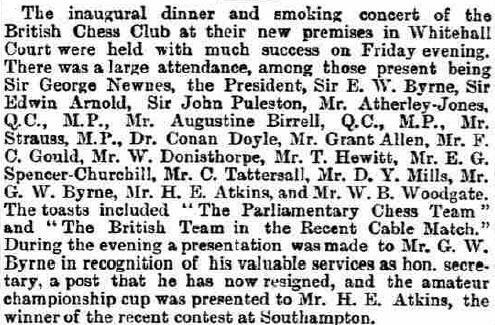 ‘The “Old Chess Columnists’ Triennial Outing” took place this month, when the BM and his old contemporary “T.W.S.” of the Luton News appeared, like Pistol and Bardolph, at the BCF Congress at Brighton, having been officially informed that not only was “Admission Free” but that “Visitors would be welcome”. Of course, the BM has heard this last one before. 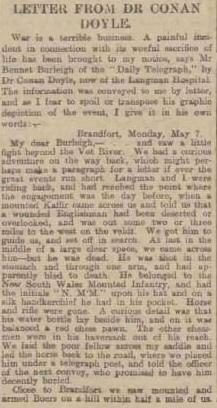 Too often has he been allured by “friendly” Congresses where, after timidly creeping halfway through a forbidding door with its handle muffled, and with “Strict Silence During Play” placarded all over it, he at once received “the icy eye” from an official at a side table, and remained frozen to the spot, causing a second official to growl like Larry Grayson “Shut That Door”. But this goes back to the “stiff collar and heavy moustache” days of the Georgian era, a very different setting from that in August 1984; when the great Hall of the Brighton Centre was filled with hundreds of competitors in holiday attire, and though “it would help to minimize noise if players and spectators wore soft-soled shoes”, the atmosphere was cordial; it was “Quiet please” rather than“Shut That Door”, and officialdom, brilliantly though unobtrusively organized, kept, as the papers say, “a low profile” and presented “a benevolent image”, especially when “baby-sitting” with the Under-Nines. Among the performing “greats” the BM (though with difficulty) recognized our new Grandmaster (and, as it turned out, Champion) Nigel Short – considerably elongated since the BM last saw him in 1978 when he demolished the City of London in a famous “simul” at Salters’ Hall – Tony Miles looking very relaxed after recent stern grandmaster Tournaments, and – sauntering amiably between his moves in the same carefree manner as Charles the Second – Jonathan Speelman, Champion in 1978, rather reminding one of Zukertort, though Z.’s was a heavier countenance. 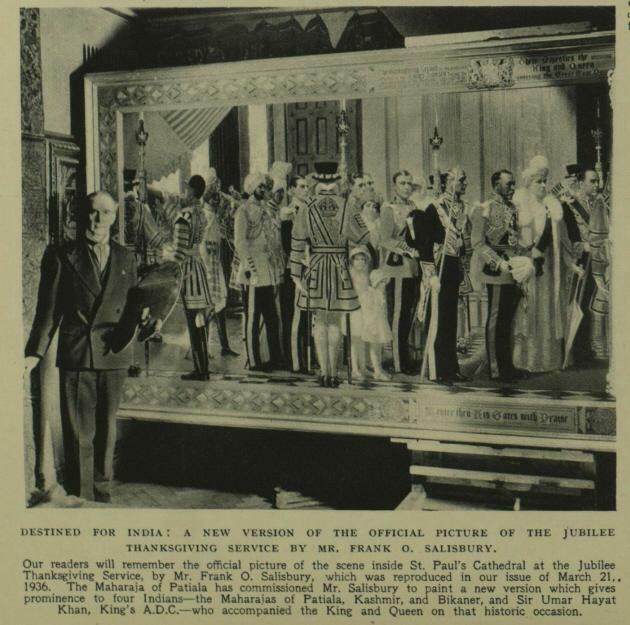 But apart from the Championship itself, equally illustrious faces were to be discovered “in another place”, as it would seem that famous surviving Championship warriors of the past are now serenely elevated to the House of Lords, i.e. 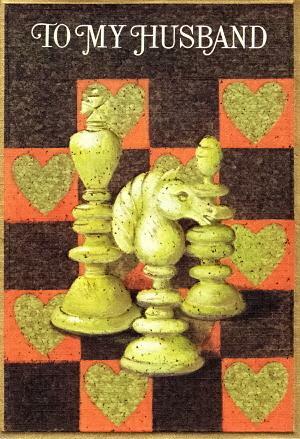 the Veterans’ Tournament. 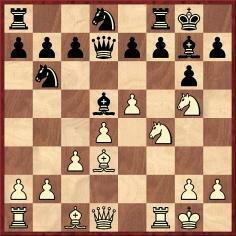 It was pleasantly nostalgic to observe the two great Congress Archbishops of British Chess History, Harry Golombek and W. Ritson Morry, amicably crossing swords once more, though the latter seemed to be attempting to “smoke the unsmokable” – the tiniest of cigars resembling a “true geometrical point” which (says Euclid) “has position but is said to have no magnitude”. 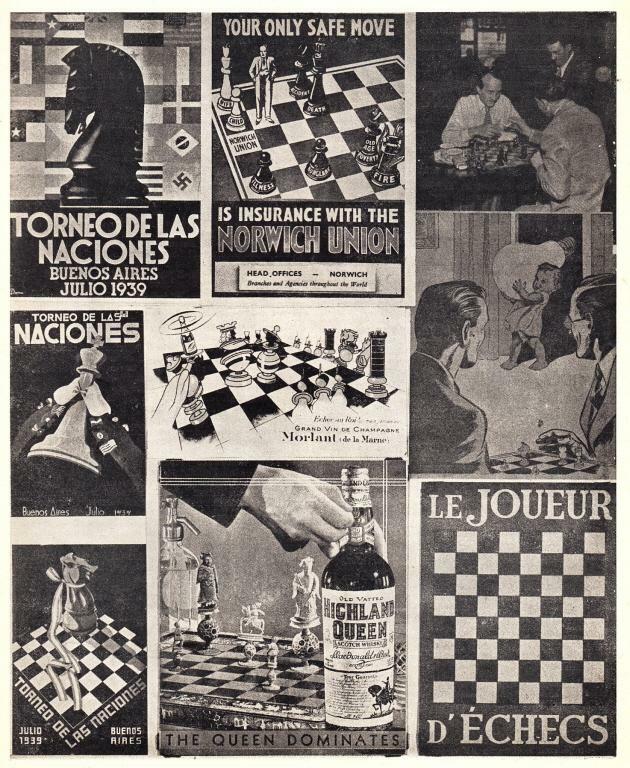 It was stated that the three olympiad posters (by, respectively, B. Juan Dell’Acqua, Ernesto M. Scotti and Alfredo Franzetti) were the winners of a competition set by the organizing committee, that the Norwich Union poster appeared during the Nottingham, 1936 tournament, that the photograph in the top right-hand corner was published in the Schweizer Illustrierte Zeitung of 10 February 1937 in an advertisement for the painkiller Togal, and that the light-bulb advertisement (Philips) was taken from the Algemeen Dagblad of 16 March 1948. 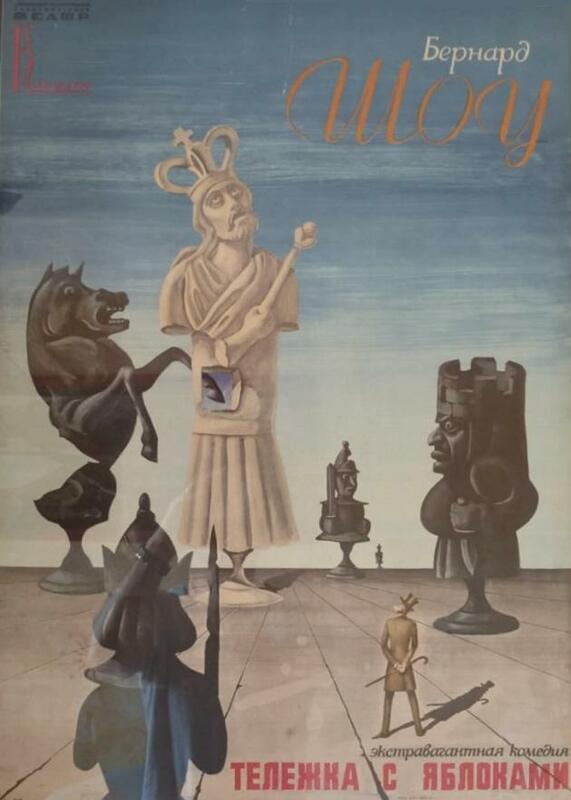 Arthur Kaufmann is a curiosity among twentieth-century masters in that he has yet to be positively identified in any photograph. 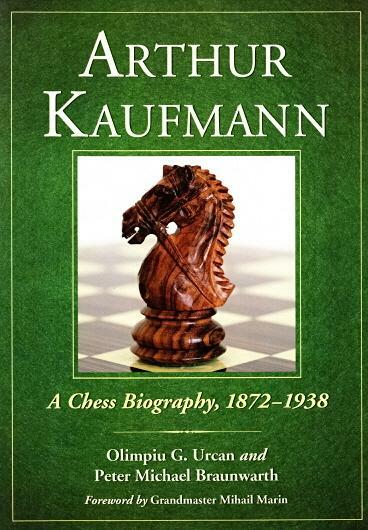 The new monograph Arthur Kaufmann A Chess Biography, 1872-1938 by Olimpiu G. Urcan and Peter Michael Braunwarth (Jefferson, 2012) has been able to trace but two brief physical descriptions of Kaufmann by contemporaries (Josef Krejcik and Bettina Bauer, on pages 19 and 119 respectively). 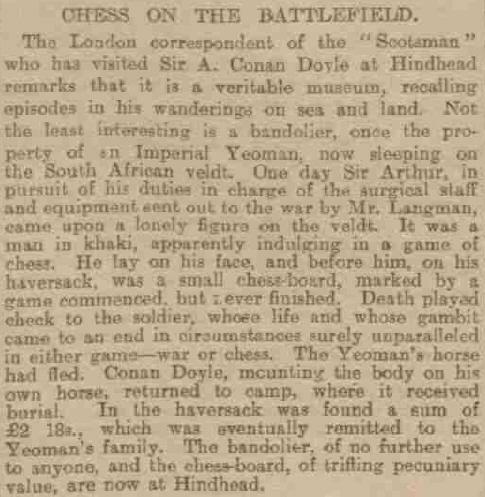 What is known about Conan Doyle and chess? 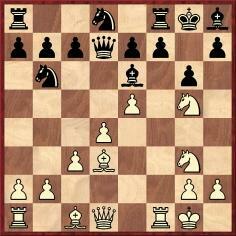 ‘C.N.s 4703 and 4715 comment on the book Essays on Chess (Bombay, 1814). Its original Sanskrit title is “Vilas-mani-manjari”, and the author’s name is indeed Trivengadacharya. I am now in possession of a copy of the 87-page book which contains the Sanskrit text of the original manuscript and comments in Marathi added by the historian V.K. 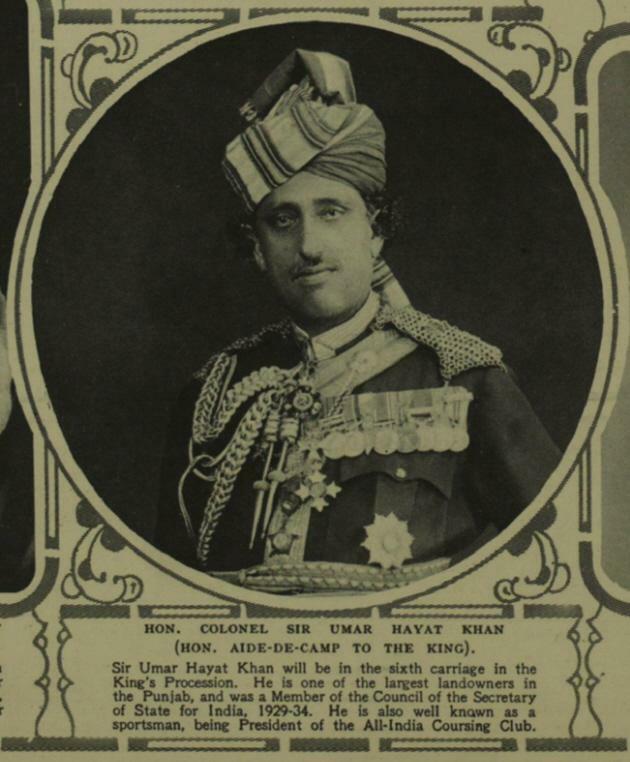 Rajwade (1863-1926); it was published by the Rajwade Research Centre, Dhule, after his death. The book is printed in Devanagari script, which is used to write Sanskrit (and Marathi). Devanagari is phonetic in character (having 36 consonants and 14 vowels). The spelling and pronunciation of names (and words) are identical in this script. 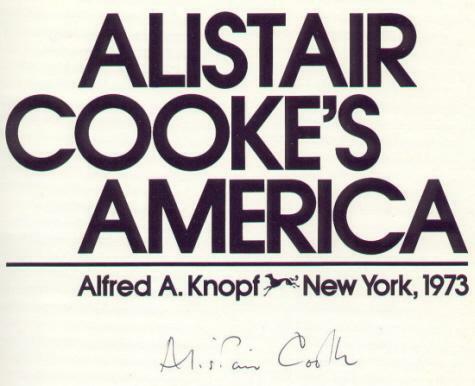 The Factfinder contains a number of references to Alistair Cooke’s interest in chess. 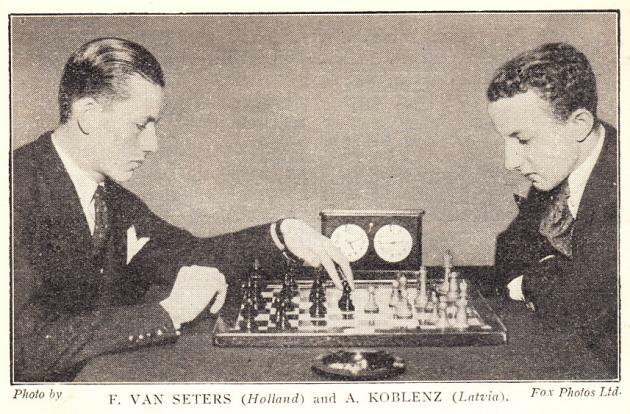 We note now a video clip in which he introduces a production of The Royal Game by Stefan Zweig. 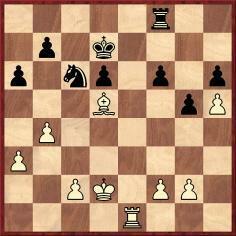 7522. 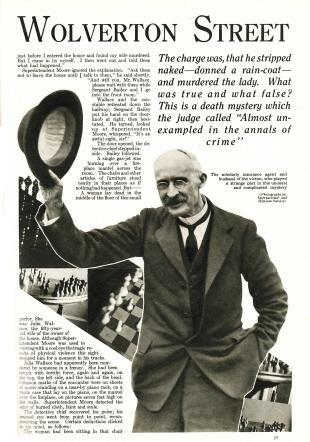 A ‘celebrated saying’/‘famous maxim’? 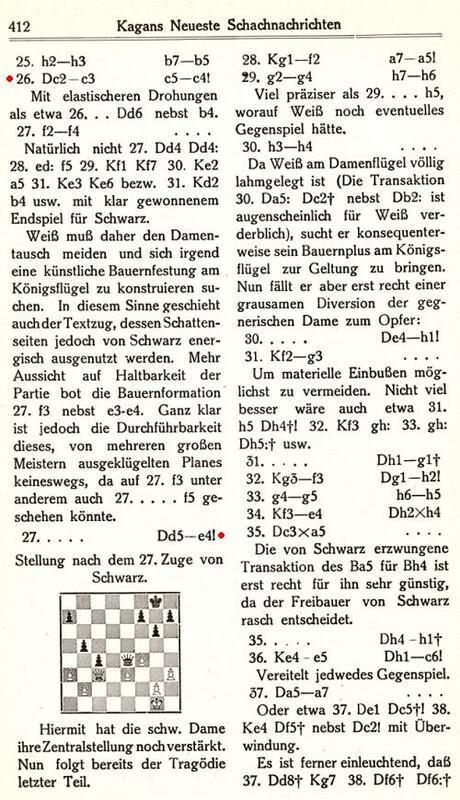 Steve Wrinn (Homer, NY, USA) notes a discrepancy in the game-score Grünfeld v Tartakower, Semmering, 1926. 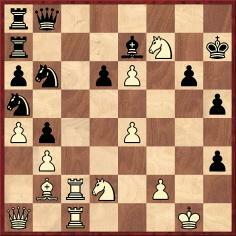 For the forthcoming book on Indian chess history referred to in C.N. 6152 Manuel Aaron (Chennai, India) is trying to resolve a discrepancy concerning the result of the tournament held in Chail (Patiala Princely State) from 29 May to 13 June 1925. The crosstable indicates that B. Kostić finished second with ten points, half a point behind N.R. 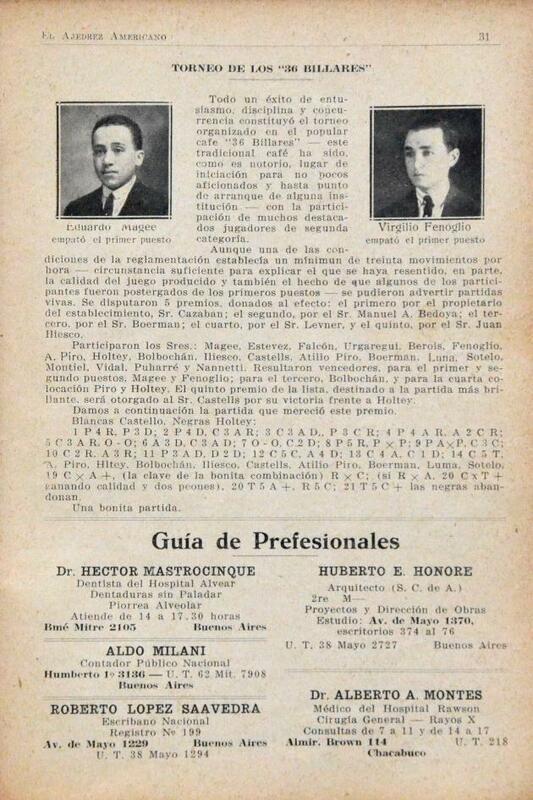 Joshi, whereas Kostić subsequently stated (East African Standard, 19 September 1925) that the two players tied for first place. 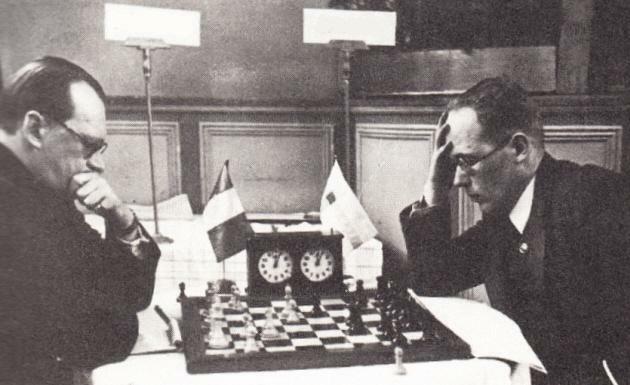 The matter hinges on whether Kostić’s game against S. Kishanlal, who finished third, was a win for Kostić, as he claimed, or only a draw. Can the game-score be found? 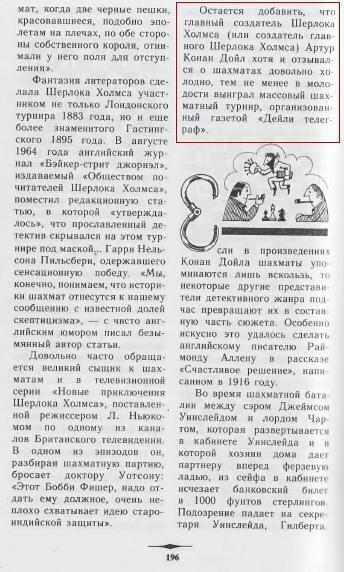 Stephen Davies (Kallista, Australia) notes that there are frequent references to Daniel Starbuck, including a number of additional game-scores, in Mirror of American Sports of the 1880s. A file is accessible from the first page of the index of the Cleveland Public Library Digital Gallery. 39 Nf3 Rxf7 40 Ng5+ Kh6 41 Nxf7+ Kh7 42 Qxc5 Nxb3 43 Qe3 Qf8 44 Qxb3 Qc5 45 Qb2 Rg8 46 Bd4 Qe7 47 Bf6 Qc5 48 Ng5+ Kh6 49 Qd2 Qf8 50 e5 Rh8 51 e7 Resigns. Source: page a7 of the New York Post, 14 January 1939. 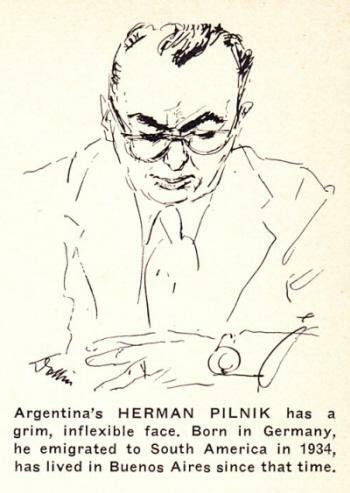 In the same magazine (January, 1949, page 10; May 1949, page 151; September 1949, page 258; October 1949, page 292) there are references to Pilnik’s movements, but with nothing about any tournament in Havana. ‘Rogan worked intently at the table for nearly three hours. 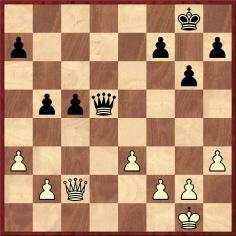 He drilled a hole in the bottom of the king, and then took the bottom out entirely. Working very carefully, he hollowed out the inside of the chess piece and packed it with liquid explosive, wires, and the tiny electronic parts. When he was finished he put the bottom back on, and then with buffing cloth and enamel he hid all scratches and chips. 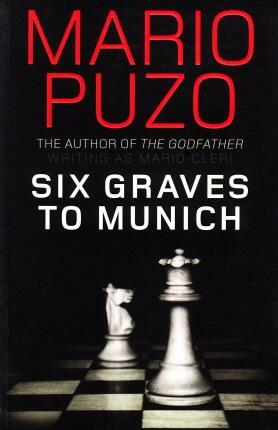 He held the chess piece in his hand, trying to see if the extra weight was too obvious. He did notice a little difference, but he reasoned that this was because he was looking for the difference. 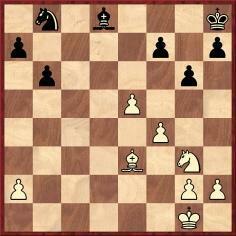 The piece would pass.